Although we had free nights at a hotel, the prices of hotel rooms were dropping dramatically a few weeks before Thanksgiving. 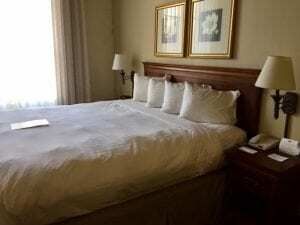 When we originally booked, prices of moderate rooms were about $150-175 per night but at least two weeks before Thanksgiving prices for nice hotels in the French Quarter or within a few blocks of it were under $110 per night. The Sheraton was $80 per night, the Westin was $100, even the Fairmont was $110 per night. Our e-certificates expire 12/31/16 so we used them but I was shocked at the low rates. Our Uber driver told us New Orleans hotels are cheap as long as there is not a convention or football game in town, or during Mardi Gras. Technically the Country Inn & Suites is not in the French Quarter. It’s 2 blocks away but overall in a good location. The lobby has nice architectural features, with rustic wood beams and open up to the roof four floors above. There’s a very small courtyard heated pool with some seating around it. Additionally, there’s a small bar and restaurant attached to the hotel. We went there for a cocktail but drink prices were actually a little more than in the Quarter. The interior of the rooms are standard hotel rooms. We were upgraded to a suite, which had living room attached to the sleeping room. Our room also had a mini fridge, microwave and coffee maker. It’s really important to know that many of the standard rooms (without the living room) face the 4-story lobby and do not have exterior windows–that would really bother me not having any natural light and not being able to keep your drapes open during the day without people looking in on you. Breakfast was included which featured eggs, sausage or bacon, waffles and your usual fruit/yogurt/bagels, etc. Breakfast was always crowded during our stay and the staff had a hard time keeping the food supplied. The hot water and coffee containers were often out and needed replenishing. The staff worked hard but there were not enough of them. We took advantage of 3 walking tours with FreeToursbyFoot.com during our stay. We took a culinary tour, which was mostly about the history of Creole and Cajun food. We actually only tasted a few small things. It was interesting but not the best free culinary tour we have ever taken and we once took a paid culinary tour in Lisbon, Portugal for about $36 per person that was outstanding and fed us quite well. We also went on a Voodoo tour, which was actually more of an explanation of what Voodoo is and isn’t (debunking the Hollywood image), and the origins. The tour guide is a Voodoo priest and has a long family lineage in the religion. It was much more interesting than we expected. And lastly we took a history walking tour that provided general historical background of New Orleans and particularly the quarter. That would have been the best tour to start with but the timing didn’t work out that way. Regarding the tipping, I have seen some people roll up a few singles to hand the guide and I’ve seen people whip out a few $20 bills to give the guide. Unfortunately, I have occasionally seen people take off just before the end of the tour and not tip anything, which is not cool. 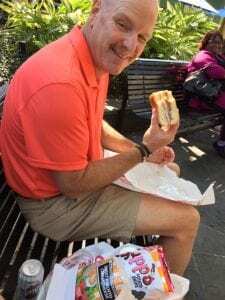 We have been to New Orleans about 6 other times and so we have some favorite places and dishes, and spent some money that really wasn’t worth it for what we got. I am going to tell you what I think are the best food and drink values. Gumbo–Nearly every restaurant offers gumbo. Some are better than others but all that I have had are good. I think a $6 cup of gumbo is kind of high priced but a $10 bowl with some French bread is enough for a meal, whether lunch or dinner. Central Grocery Muffaletta–It’s famous and worth it. Bob and I split a half a loaf ($9) and get sodas and a bag of chips. Then we walk across the street and sit in a park where we can hear some jazz in the background. A great lunch value! I think their muffaletta is MUCH better than any po’boy sandwich I’ve had and I’ve had quite a few. Jazz Brunch at Commander’s Palace–This is a splurge. They offer many 3-course options for $37-45. Considering the atmosphere, the entertainment and the quality of food, I think it’s a good value for the money. Take the St. Charles streetcar for $1.25 each direction to the restaurant. Beignets–I’ve had them at The French Market and at Cafe Beignet on Royal Street. To me they taste the same and both are worth the money. A great afternoon snack and large enough to share between 2-3 people. Superior Seafood–Located in the Garden District, it is a good spot for tourists and locals. The happy hour .50 cent oyster deal is great. 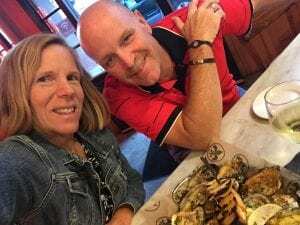 We started out at happy hour for an oyster appetizer and a half-price bottle of wine, which we then took the remainder of to our table to drink with our entrees. Seafood and fish entrees are about $22 but sandwiches and salads are $15-16. New Orleans Creole Cookery–I can only speak about the happy hour char-grilled oysters. It costs $1 for each char-grilled oyster and .50 cents for a raw oyster–they are the cheapest in the French Quarter and they are very good. The restaurant has happy hour beer specials also. We have had char-grilled oysters at Felix Oyster Bar and The Royal House Oyster Bar and while they were very good, you can’t beat the price of happy hour at the New Orleans Creole Cookery! Happy Hour ANYWHERE–I have a hard time paying full price for a drink when there is a happy hour almost any time somewhere in or around the French Quarter or Garden District. Lunch at Antoine’s–We have not done this but it is at the top of my list for our next visit. The restaurant is 176 years old and is in it’s fifth generation of ownership within the same family. They have a $20 lunch menu with several options that is a fantastic value for such a famous restaurant. Uber to and from the Airport–Expensive! Right now Uber is the only ride share allowed to go into the airport and the price is only a few dollars less than a cab. Our Uber fare was $33 and a cab is set at $35 each way. I think once Lyft is allowed to go into the airport those costs will drop…I sure hope so! In the past we have taken a city bus from the airport to downtown and then walked about 7 blocks to the French Quarter. Public transportation is a great option if you are really strapped for funds but it’s a time consuming process and not a good choice if you have a lot of luggage. When we first visited New Orleans about 20 years ago we were on a super tight budget. In fact, we spent the first night at the YMCA! We had a great time then, and we keep going back to NOLA for the food and fun! There is no other U.S. city quite like it and fortunately, it has lots of low-cost options for a great time.